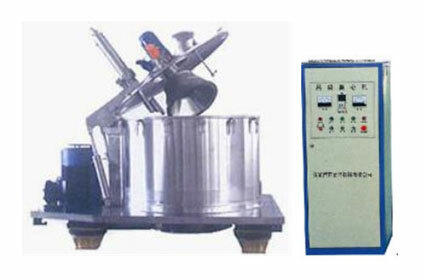 The main part of the centrifuge is a bowl and its functional parts of scraper action,mechanical drive and casing are all modularized.They can realize the optionally multifunction combination. Mode of scraper action:hydraulic,pneumatic,electric or manual. Braking casting:convertional braking unit,manual braking shoe. Cover: full opening lid,semi-opening lid or closed lid. The bowl casted in stainless steel rotates simultaneously together with the mainshaft,which is driven by the pulley with the conductive static V-belt by a motor.The material is fed into the basket through a feeding pipe.The material is splashed onto the bowls wall under a centrifugal force field.The liquid flows into the casting space through the strainer and perforation,falling on the chassis and then draining out from the liquid outlet,and solid is left behind the inner surface of the strainer.The layer thickness is controlled by the special dedicated detector of the material level.Both feeding and washing will be controlled by the only used feeding valve.After the basket is turned to the state of discharging speed the solid will be scraped off by the scraper and then discharged out of the bowl from the bottom outlet.